Thank you for a wonderful vacation! We had so much fun with you guys! We really appreciate all that you did for us and will remember it always (thanks to mommy and all the pictures she took!). It is great to see Tyler interact with you both-- we loved to see him warm to you both so quickly. Tyler definitely will be talking about this trip for a long time. We will hopefully see you soon on the East coast (hint, hint!). We miss you guys and big family hugs and kisses from all of us! Tonight, Frank, Grandpa, and Tyler all went fishing down at the docks. As you can see from the pictures, they were very successful with their outing. Tyler caught a fish with Grandpa's help-- in fact, they caught five! Maybe next time they will make it out in the boat and can catch some really big ones! "Dinner? Nah.... Just Tyler, the lean mean fishing machine!" Grandpa and Tyler casting and reeling. I think we will have to look for a smaller pole next time so Tyler can maneuver on his own. This morning after we woke up, we went for a ride on grandpa's boat. Tyler remembered this from last year, when he wanted the boat to go "really fast!" Grandpa did not want to disappoint, so we all went for a ride on Lake Monroe. It was a little cooler outside after some rain last night, but the lake was like glass and there were not a lot of people around. We took a ride over to the Paynetown section of the lake and gawked at "John's" house (what a nice place!). Tyler had fun sitting with Frank at the bow of the boat and going over the wakes. Grandpa even gave Tyler a chance to drive the boat and make press down the throttle! Frank and Ty waiting for Grandpa to put the pedal to the metal! Me and my two guys! Look at the cool do! That's what happens when you sit at the front and go fast, fast, fast! Boating makes me really hungry. I guess it does the same for Tyler. After we got off the lake, we went over to Jiffy Treet! We ate fried tenderloin (keeping it really healthy on vacation-- but a must have when in town!). For dessert we had to indulge in some ice cream. Tyler had his usual, vanilla with M&M's. I had a scoop of Cookie Monster! Yum! Whenever we are in Bloomington, we always stop by Wonderlab, the science museum in Bloomington for children. Louise, the great mother of Harry, has helped build Wonderlab into what it is today. Currently, they have a fantastic building in downtown Bloomington and Tyler always has a blast running around to all the different exhibits. This past weekend, there was a special event going on at Wonderlab called "Viva Wonderlab!" Grandma and Grandpa came with us and we all had a lot of fun learning new things! It was especially fun with all the different exhibits they had set up. Frank got inside a body bubble, Grandpa ripped the tablecloth from under a place setting, I touched snake skin, and Grandma had fun watching the hot air balloon exhibit. On top of all that, Tyler went bowling with dry ice, froze a Popsicle with liquid nitrogen, made a bag of green slime out of Borax, built a rocket out of Alka-Seltzer and a film canister, and froze bubbles with dry ice. Frank took this great picture of me with my little guy. We have had a lot of fun playing together over the past few weeks! Yummy! Tyler eating his liquid nitrogen frozen Popsicle. Getting ready to bowl with dry ice. He was given a glove to wear to keep his hand safe. The ice was very slippery and he never touched it without that glove (thank goodness!). Every year we go to the museum, and every year we watch as Ty runs from the dinosaur! This year he walked right up and stood under it and followed the directions it gave-- it told Ty that he was 3 feet, 2 inches tall! Another first for Ty-- he attempted to climb up the climbing apparatus that scales the indoor part from floor to ceiling. He got about 1/3 of the way up and then wanted to come down. I think we have all been there. You grow up, you move out of your parents house. You leave things behind when you move out, you bring things back when you move back, and the process goes on. Until you really grow up. I am at that stage (maybe I have been there?) right now. My parents have been saying for awhile now that they want my room cleaned out, they think my stuff belongs in my house (why?).... Frank's parents have the same thought process. For months now every time we see them, they have more boxes for us. Needless to say, we keep adding them to the boxes that never were unpacked when we moved (October, 1996, but who is counting?). Some day we will get to them. For now, we go through them and reminisce about our kid days. Frank's boxes have been quite fun-- Star Wars toys, Planet of the Apes characters, Tonka Trucks, old hockey things. I will find a way to display most of this stuff, so come for a visit and you can stay in the retro toy guest room! I went through some of my old boxes tonight. When I was home last summer, I read and then threw out most of the notes I had kept from middle and high school-- by today's standards, they are pretty close to making it to the antique stage. Really, what were we talking about? Was it really necessary to send a note to just to say how bored we were? And for Pete's sake, I can't even fold a note like that again if I tried!?! -Alanis Morrisette concert ticket-- she really was great! How is that for random things that just need to be saved? What do you have that you can't part with? Among all of this, I have cards, letters, notes, and other random stuff from college and beyond. I haven't even gotten to the Barbies yet! What am I supposed to do with it all? Right now I consolidated it all into a smaller box-- not sure that it what the parents had in mind when they meant clean it out. Think they will notice that I only moved things around? Today we got together with my college friends. I met Amee, Heather, Jennifer, and Kelly at Indiana University where we all were sorority sisters at Alpha Omicron Pi. We do not have many chances to see each other and hang out, but this year we managed a girls weekend in April in Chicago and then today we all were together with husbands and kids. It was a little crazy, but everyone had a blast! We ate lunch at my parent's house and then headed out to the pool. Frank even managed to squeeze in a round of golf with Jeff, Heather's husband. It was warm and sunny outside and made for a great swimming day! In April, none of us were pregnant (which has been the norm for the better part of the past 4 years!). Now, Heather is-- Congrats to Heather and Jeff. I had never met Clare, Kelly and Keith's youngest daughter (she will be one in a few weeks) and Jennifer had never met Amee's youngest, Grant (who will be 3 in October). All in all, there was a lot of catching up to do after 4 short months! Kelly made each of us a DVD slide show with old pictures in it and we all realized have been friends for 13 years! Wow! Here's to 13 more and many more after that, girls! Eating lunch with the group! There were 6 kids under the age of 4! Around the table are: Tyler (green and white striped shirt), (Keith) Clare, (Heather) Jack, Grace, Grant, and Rileigh. It's a little tough getting all these kids to look when lunch is being served! Jack and Rileigh waiting patiently for our trip to the pool. Tyler, Jack, and Grace at the pool. "Giddy up, giddy up!" Grace caught a ride home on the duck. He moved a bit slow, he's got lead feet! Jack, Grace, and Tyler playing outside after our trip to the pool. They all had a great time and played wonderfully together! Tyler introduced Jack to the great game of hockey. Tyler was so excited to have a friend to introduce to hockey! Thanks Jack for playing along! I had to put this picture in-- so cute! Clare and Keith taking a break at the pool. What a trooper she was! On Thursday, Tyler, Grandpa, Frank, and I traveled to Green Bay for the Packers stockholder meeting. We got there at 9 A.M. and left at 3 P.M.. The minute we walked into the stadium, there was Packer stuff everywhere-- all except for players. Tyler kept asking where the players where and when the game was going to start! It took a lot of explaining, but he finally understood that the players were all on vacation and they would be coming to camp very soon! On the way out of the stadium there way a man standing there-- possibly a player-- and Tyler looked at him and said "he's a Yankee." The man looked at him and said "what?" -- I had to explain to this very large man that my son thought he was a baseball player for the New York Yankees! Tyler ran through tires, blocked players and climbed walls. He may not have the size to become a nose tackle, but he certainly has the speed and gumption to become a kicker! Nor will Bart Starr! (Grandpa, Frank, and Tyler with the Bart Starr statue). Grandpa posing with a superfan-- half Elvis, half Cheesehead! A picture with the man himself-- Vince Lombardi! Every summer, we travel to the Midwest for our vacation. Some people go to the beach, others go camping, we go to Indiana! A few summers ago, we traveled to Camp Brosius in Wisconsin, the IU Alumni Camp. We decided that we would go there for a week then travel to Indiana for another week. Plans do not always go accordingly.... Brosious was full and I could not spare two weeks of vacation time. So we went back to the drawing board. We decided that we would stay at Fox Hills, a golf resort in Mishicot, Wisconsin. Mishicot is a small town right outside of Two Rivers, Wisconsin, where my parents grew up. As a child, my Grandma owned a small cottage at the end of Main Street and that is where we would stay during the summers when I was child. We even came one Thanksgiving and went sledding down the hill in the front yard in antique bedpans.... During summers we would fish for crayfish in the stream next to the house. In the evenings we would walk down the block to the best ice cream parlour in the state (bubblegum ice cream!). My Grandma eventually sold the cottage and when we drove by it this week we did not even recognize the place! Enjoying a Lienie's on our balcony. We had perfect weather all week long and thoroughly enjoyed our patio. Tyler peeping out of the play house at the Fox Hills pool. The view from our room-- hole number 9 on the Fox Hills red course. On the swing with my son at Neshotah Park in Two Rivers. I used to go to this park with my aunts and cousins to play. My Grandma Perry took us here once to a carnival (I think I was about 9 years old). The park is almost exactly the same as I remember! Playing on the teeter-totter Neshotah Park. The family that teeters together, stays together... Lesson #431, don't wear skirt on the teeter-totter. Spending time with Grandpa Perry in the Fox Hills pool. Playing Foosball at, the bar at Fox Hills. 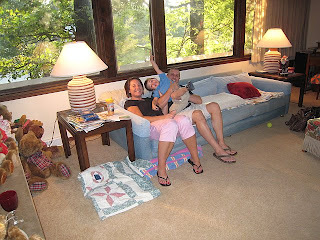 Frank and I were able to come back when Tyler was asleep (thanks Grandma and Grandpa!). As a kid, I used to play Foosball at every restaurant we would go to in Wisconsin. I guess it is a right of passage that you bring your child into a bar and play games while you drink and eat! Mastering Air Hockey at Benchwarmers (he's going to give his mom a run for her money when he gets older!). We traveled to Port Sandy Bay on Monday night. Read the sign. I had to take this as we were on our way out. This was a great pizza place that we would eat at a long time ago. The adults would eat and drink and the kids would eat and play Foosball! Grandma, Grandpa, and Frank on the deck outside our room. We relaxed with a few Lienie's! Yummmmmm! Ice cream from ice cream store in Mishicot. As full as I was from dinner that night, I made sure I had some room! A four generation picture. The last one we took was when Tyler was 1 1/2 years old. We were able to stop in Appleton one night to see more family. Around the the table: cousin Brian, Brian's wife Amy, Grandma Perry, Aunt Jean, Uncle Ronnie, Brian and Amy's daughter, Alexis, cousin Barbara's son, Joey, son, Mikey, daughter, Monica, cousin Barbara, Grandpa Perry, myself, and Tyler. 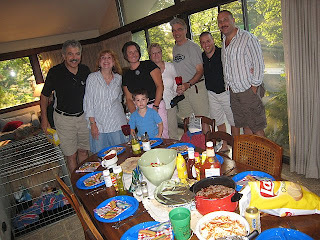 We had a great time with everyone-- some people we had not seen since our wedding in 2001! Amy was a great host while the guys went fishing and made us yummy margarita's (which I made sure to get the recipe for!). On Wednesday, I headed out with Grandma, Great Grandma, and cousin Lindsay to go antiquing. Frank went golfing in the morning and that left Tyler and Grandpa for the rest of the morning and part of the afternoon. When I was a little girl, there was a zoo in Manitowoc that I loved to go and visit. It was not very big, but did the job of fulfilling my zoo fix. Grandpa had the great idea of taking Tyler to that very same zoo. The two of then had a blast together! Better yet, Grandpa said that Tyler was on his best behavior! They saw panthers, foxes, wolves, reindeer, and eagles. Tyler said his favorite part was the bears (even though they were hiding in their enclosed area). Tyler posing with the Prairie Dogs. Fooling around with the lion statue. Catching up with daddy at the Fox Hills resort after his golf game. Lucky guy went for a ride on the golf cart! Grandma, Great Grandma, Lindsay, and I all had a great time antiquing. Frank is thankful that we do live so far away on days like this-- I have no problem finding odd treasures in Wisconsin that will look great at our house. The only problem is shipping... maybe someday I will be able to take a road trip there and stock up on goodies! I did manage some small treasures-- and old egg basket, baby bib and jumper, and antique kitchen utensils for a project that I have in mind. On Sunday after we left Woodridge, we continued our trip North and eventually landed in Wisconsin. We stopped for another wonderful meal with Great Grandma Posny, Uncle Bobby, and cousin Lindsay. Uncle Bobby made us his famous Wisconsin Brats cooked in beer and Lindsay played bartender and made us all tasty Old Fashioned cocktails. Living so far away from family makes it hard, but it is always wonderful to be able to go back and visit and talk about old times. It is harder now between work and family to get together with everyone but this was the second day of our trip and already we had visited with as many people as we possibly could! While the adults were hanging out and catching up, Lindsay pulled out some toys for Tyler to play with. He had a great time on the deck building a little village, complete with parking lot (in the background). Overall, it was a great night and we were happy to be able to spend some time with our Manitowoc family-- thanks everyone! On Saturday, our final destination was my Aunt Pam and Uncle John's house in Woodridge, Illinois. It was great to get to spend time with family who we do not get to see on a regular basis. Tyler had a wonderful time playing with their dogs, Heidi Rose and Watson. They made a wonderful dinner and we even got to feed the raccoons at dark. Although my cousin Adam could not be there, we were able to talk with him via Skype. He and his girlfriend are in St. Kitt's where Adam in finishing Vet School. I have not seen my cousins Jason or Adam since Frank and I got married-- 7 years ago! Tyler loved his cousin Jason and after such a fun night, Tyler fell right to sleep as soon as his head hit the pillow! Thanks to everyone in Woodridge for such a fun night! Maybe next time we won't be so pooped and we can all hang out for longer! Fooling around on the couch. Who knew that after 3 hours of driving and 3 hours of flying that we would be so tired and want to sit? 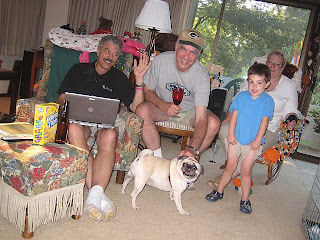 Uncle John, Grandpa Perry, Tyler, and Grandma Perry (and Heidi Rose!). 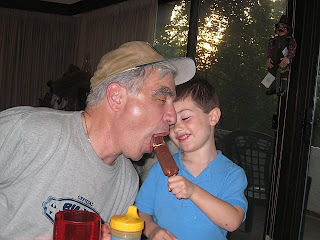 Grandpa Perry bumming a lick of Tyler's dessert. What a lucky guy grandpa is! An after dinner picture. 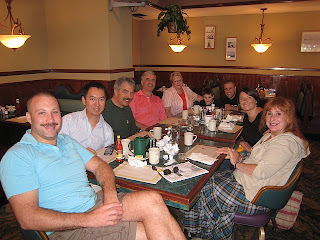 Uncle John, Aunt Pan, Tyler, Jennifer, Grandma Perry, Grandpa Perry, Frank and cousin Jason. At breakfast the next morning. We enjoyed a nice church service and the headed out to eat. Tyler was an angel at church and at breakfast. He was even an angel for the 3 hour trip we had ahead of us! Tyler helping Uncle John walk Heidi Rose-- he loves to help out! Shhhhhh, Do you hear that? A day with the Isles!